We use a lot of rather interesting and sometimes unusual fabric and materials in our accessories and here we look at their history, creation and sources which in themselves are often extremely fascinating. Here are some of the African fabrics we use so you can become more familiar with their names and know a little bit about the origins of your purse, tote or clutch. We feel it is important to celebrate the history, skill and artistry involved in the production of these fabrics and here is our own little contribution. Lets us know what you think. 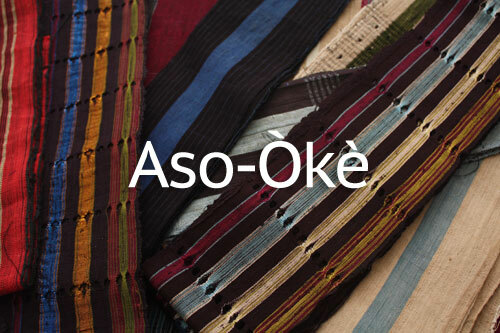 Aso-Oke (pronounced ah-SHOW-kay) is short for Aso Ilu Oke which means clothes from the up-country. It is a hand loomed cloth woven by the Yoruba tribe of south west Nigeria. It is usually worn on special occasions like coronations, festivals, weddings, funerals, engagement parties, naming ceremonies and other important events; serving as formal wear. Aso-Oke is often worn as Aso-Ebi (ebi meaning friends and family) where similar colours are worn by friends and family to a particular occasion to symbolise unity. There are three main types of traditional Aso-oke based on their colours. The original versions of these cloths are now quite rare and are fast becoming vintage finds. Etu is a deep blue, almost black, indigo dyed cloth often with very thin light blue stripes. Etu means guinea fowl, and the cloth is said to resemble the bird’s plumage. Sanyan is woven from the beige silk obtained locally from the cocoons of the Anaphe moth, forming a pale brown/beige cloth. Alaari is woven from magenta waste silk. The fabric comes in narrow strips which are sewn together to form a garment. The history, techniques and skill that go into making this fabric make our products incorporating Aso-oke, truly special. Care of Aso-oke: Aso-oke garments can be carefully hand-washed or dry-cleaned. We would recommend that you spot-clean or dryclean your Aso-oke products from Urbanknit. Adire (pronounced ah-d-reh) is the name originally given to indigo dyed cloth made by Yoruba women in south western Nigeria using a variety of resist dye techniques. The techniques used to create the organic and distinct patterns vary widely and include folding, stitching and threading before dyeing. The term Adire is now used more generically to describe ‘tie and dye’ fabric. These dyeing techniques are similar to those used by different cultures all over the world like Shibori techniques of Japan. The fabric typically comes in lengths of 5 yards. 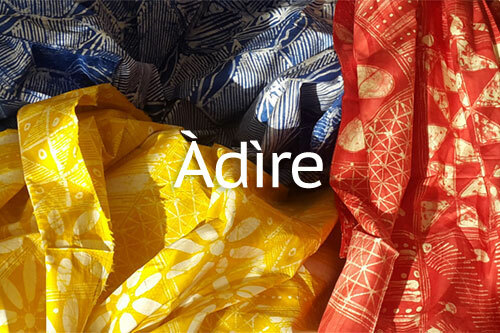 Care of Adire: Adire garments should be carefully handwashed or dry-cleaned to preserve its colours. We would recommend that you spot-clean or dryclean your Adire products from Urbanknit. Ankara is a printed cotton textile which has origins in Indonesia, the Netherlands and England. The bright colours and bold patterns have been wholeheartedly adopted by West Africans and is worn for both formal and casual occasions. The fabric often comes in lengths of 12 yards which in themselves are like large pieces of art. This makes each accessory a small portion of a larger picture. You get tiny piece of the puzzle! 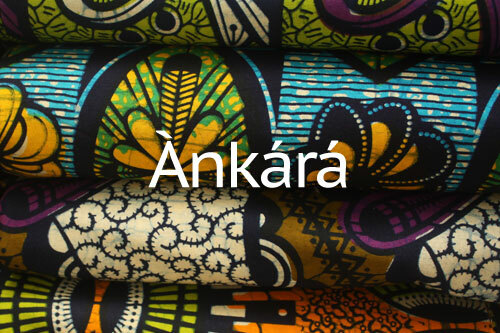 Care of Ankara: Ankara garments can be handwashed or machine washed. We would recommend that you spot-clean your Ankara accessories and from Urbanknit.